It is fun to check up on the young bands I pretend to call “mine”. “Mine”, in a sense, that when nobody knew about them I got a hold of their early demos and reviewed them for this site. Such is Hyperborean, Polterchrist, Where She Wept, and lately Beyond the Flesh. Such is also Greyswan, melodic atmospheric doom band from Italy. 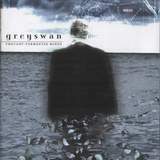 In 2001 Greyswan released a 3-track demo which I have reviewed here. Sad and melancholic, the band delivered three pretty memorable tracks with emotional clean vocals. As I said then, the question was whether the band has the staying power and whether it can deliver a full-length. So, in 2003, the question got an answer. A full-length Thought-Tormented Minds is out on the small Dutch label Cold Blood Industries. The album is really difficult to track down, but I encourage you all, the lovers of melancholic metal, to spend some time doing so. After an electronic ominous intro the band gets right into the business of how they play metal. Questions has stretchy droning guitars playing not so well defined, amorphous riffs. The whole structure of the music is akin to the shapes sand takes on after being washed up by the sea several times. The drumming is slow and deliberate. The melodies are tormented. The vocals are wailing in pain. Oh, yes, Greyswan did not change much. The next song is the Greyswan “classic” Sleepless Night. Good choice for including this on the full-length. I simply could not get it out of my mind then, and I sure as hell am mesmerized now. I think the song is now a little heavier and has more production fuzz (more on this later) leaving you to figure out the melodies underneath. I just love how the guitar solo goes all the way to the end seemingly not caring about the vocals, or the rest of the world for this matter. The theme of tragic clean vocals, melancholic and depressive music is what Greyswan is all about. Songs like This Gloomy Sickness and We’ll Never Be will scar you soul, trust me. The beginning of Afraid to Go On, Afraid to Come Back seems almost Pink Floydish if not for all the distortion in the guitar department. Greyswan try a few new things. Lost Smiles is not as heartbreaking, but more quiet and introspective, and piano touches on We’ll Never Be are pure genius. Some solos are more defined than others, like alarms blaring for help to come and save our wretched souls (We’ll Never Be), some are pure funeral mourning (Afraid to Go On, Afraid to Come Back). This Gloomy Sickness has nice intertwining between guitar and bass. Oscar’s vocals are clean throughout, just like Greyswan professed they would always do. While not a standout vocalist, this guy can wail projecting some extreme melancholy feelings. I am no singer, but if I could sing and I was in distress, this is exactly how I would love to do it. Compliment enough? Rhythm section is beefed up from the demo, a minor complaint then. Still, when I first heard the album I thought that the drumming was too mechanical. Later on, with multiple listens I figured out how it works for Greyswan. Drumbeats here, while obviously not fast, and neither they have to be in doom, go like heartbeats, with metronomic precision. Production is still very fuzzy, and I almost think it is by design, to draw very ephemeral vaguely defined picture which lets listener to figure out a lot of undercurrent melodies on his/her own. The most important observation I want to make here – just like I did on the demo review – Greyswan music comes from the heart, it is brutally honest. In the last couple of years two doom band impressed me like this, Mourning Beloveth (Ireland) and Greyswan. While the former masters itself after My Dying Bride, the latter is undoubtedly influenced by Anathema. Yet, with Anathema of late Greyswan out-depresses their original inspiration. Some people find melodic doom metal a la Greyswan boringly repetitive. Yes, these Italians are slow and they repeat songs’ parts. For others, music like this puts them on the brink of complete depression, and desire to just off themselves, in the band’s words “to dry your veins”. Greyswan intention is actually different, they want to show a way out, in the band’s words “to pacify your heart”. I find myself feeling something in the middle, dejected by the sad melodies yet hoping for release.